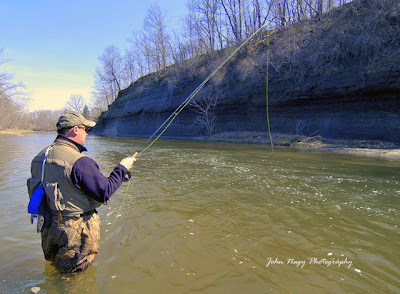 2) Don’t let your floating indicator “get ahead” of your fly when indicating with the RAFIT method. An initial upstream line mend and periodic “checking” of the buoyant float will keep the float (which is drifting in the faster water surface) in-line with the fly (which is drifting along in the slower stream bottom current). This will prevent fly from being pulled off the bottom and drifting faster than the bottom current. It is to be noted that the bottom streambed strata causes friction that slows down the bottom current. The streambed's "roughness" will determine the current speed difference between the surface and bottom currents (smoother streambeds have less of a friction effect and slow bottom currents less). This means that less float checking will be required when drifting through smoother streambeds. The opposite is true for rough bottom streambeds. Also, wind can have an effect on the drift of your floating indicator. Wind blowing downstream (in the direction of the floating indicator's drift) can speed up the float, necessitating more checking. Upstream wind directions will slow the float down and mean little or no checking at all. 3) Do use a long section of knotless tippet material when indicating (although the end may require a short section of lighter/smaller diameter tippet for finicky fish in clear flows). This knotless section permits for easy floating indicator adjustment on the leader without removing the indicator. Softer/flexible varieties of tippet material are more conducive for forming the right angle in the leader in the RAFIT method. Also use a tippet ring or tiny swivel at the tippet/leader connection in the RAFIT method. This will extend the life of the leader since most break-off's (besides at the hook connection) will occur at this point (necessitating only the replacement of a long section of knotless tippet material). This rigging also allows for abrupt leader to tippet transitions (e.g. going from 2x to 4x or 3x to 5x) with a simple clinch knot at the tippet ring or swivel. 6) Don’t make adjustments to the indicator to fly distance irregardless of the water type fished. In the RAFIT method, indicator adjustments are necessary to compensate for varying water flow depths and ultimately to get the fly down to the steelhead and drifting in front of their face. Winter steelheading often requires very small indicator adjustments. Under these conditions, one or two inches can make all the difference in the world for hooking-up with bone chilled/lethargic steelehead who seem to have a case of “lock-jaw”. 8) Don’t pay attention to what the floating indicator is doing on the water surface. Abrupt stops and hang-ups usually mean the float to fly distance is too long (fly/split-shot is hanging up on bottom) and needs adjusted. Small hesitations in the drift of the indicator like a slight bump, stop, dip or slow sinking of the indicator usually means a strike. 10) Don’t recognize when it is time to not use a floating indicator. Extremely shallow, fast runs are best fished bottom-bouncing without a floating indicator (but a small semi-buoyant “strike indicator” may be necessary for strike detection). Also, wide/long gravel runs and pools are more efficiently fished and covered by swinging flies. Indicating large rivers and big sections of water (that do not have any specific structure like a boulder or shale ledge to attract holding steelhead) can often feel like trying to find a needle (or in this case), a steelhead in a hay stack! For a more detailed explanation of the "RAFIT" method for catching Great Lakes steelhead (including step-by-step technique drawings) refer to John Nagy’s Steelhead Guide Book.